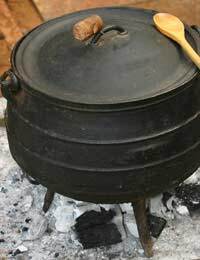 Were you to travel through African countryside, through villages and small communities, one of the sights you'd see would be a large black cooking pot, hanging over a small fire. Even today it's the most common method of cooking in rural Africa. The stew, rich in meat, vegetables and spices, would be left to simmer slowly, ready for when then men came home. And, yes, it's still the women who do the cooking! We've a couple of well-known and easy African recipes that will feed a houseful of students but whether you leave the cooking to the girls is a matter for discussion! If the apricots are whole, cut them into halves. Cover with boiling water and leave to soak for about 2 hours. Pre-heat the oven to 170oC, gas mark 3. Cut the lamb into bite-sized pieces. Heat the oil in a large frying-pan and brown the lamb a handful at a time. Remove from the pan and set aside. Add more oil if necessary and sauté the onion until soft and translucent. Add the garlic and spices and fry, stirring, for 2 minutes. Return the lamb to the pan and mix well. Transfer to a large casserole dish. Add the apricots and the water they were soaking in, the tinned tomatoes, stock, ground almonds and a pinch of salt. Stir well and cook, covered, in the oven for about 1½- 2 hours until the meat is beginning to look tender. Shoulder and neck fillet both benefit from long slow cooking. Add the courgettes, squash, tomatoes and harissa paste. If the stew looks a little dry add some more water. Return to the oven and cook for about 1 hour until the meat is tender and the vegetables soft. Wash and chop the parsley and stir in just before serving. Serve with couscous mixed with a little harissa paste. This dish will reheat well. A South African dish, it probably originated in Indonesian and was brought to Africa by Dutch traders. There are as many versions of this as there are African cooks. It's a form of meatloaf, but with a custardy topping rather like moussaka. Preheat the oven to 170oC, gas mark 3. Grease a fairly shallow ovenproof dish. Put the bread and milk in a bowl and leave to soak. While it's soaking, sauté the onion in oil until soft and translucent. Add the mince and stir fry until browned through. Remove the bread from the milk and squeeze it dry. Save the milk! Add the bread, lemon juice, sugar, curry powder, chutney, turmeric and raisins to the meat mixture and stir well. Season to taste. Place the mixture into the greased dish and flatten it to make a neat loaf. Arrange the bay leaves on top and cook for about 30 minutes. Mix the saved milk with the eggs and beat well. Pour over the top of the meatloaf and return to the oven for another 15-20 minutes or until the custard is set and browned.